When the situation requires, private jets are subjected to de-icing before take-off. On the ground, when there are freezing conditions and or precipitations, those frozen contaminants can cause difficulties on manage control surfaces and significantly decrease the ability of the wings to generate lift and increasing drag. Because of this potentially severe consequence, de-icing operation is crucial. At the beginning of every season, pilots on private jet must take a specific training of all necessary winter operation. The de-icing and/or anti-icing procedure will be sprayed on the aircraft surface (wings, tail and/or fuselage) through a fireman-like hose attached to a truck tank. The de-icing process is necessary for snow, ice or frost removal from a surface. De-icing fluids are heated glycol diluted with water for de-icing and snow/frost removal. Sometimes, this phase may be enough to make the aircraft safe for take off. In other cases, it’s necessary to proceed with the second step, the anti-icing procedure. Anti-icing fluids are those fluids that can make the surface of the airplane inhospitable for future ice formation and snow accumulation. 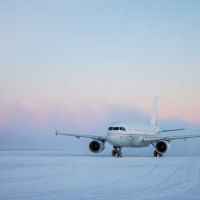 By applying chemicals, not only the airplane will be de-iced, but they will also remain on a surface and continue to delay the reformation of ice for a certain period of time. They are unheated, undiluted propylene glycol-based fluids that has been thickened, getting a pudding-like consistency . They provide overall protection while the aircraft is on the ground. Then, when the aircraft is accelerating for takeoff, the fluid becomes thinner, and run off the wings and fuselage to leave a clean, smooth and aerodynamic surface. As the effects are guaranteed only for a certain amount of time, the aircraft must airborne within that time frame, otherwise the operation must be repeated. Private Jets are equipped with a de-icing system that keep the wings clean and avoid ice forming during the flight.